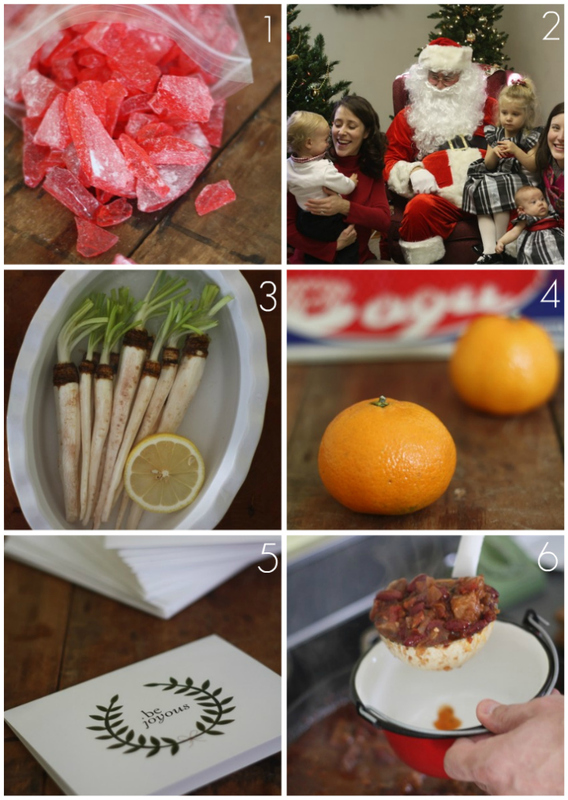 1: Christmas hard candy from our friends and home brewers, Corinna and Clay Grogan. This stuff is addicting — they were nice enough to share the recipe with us, see below for details. 2: Holiday festivities ensued - it was too hard to squeeze all of Mary's nieces and nephews into one photo block, but you get the idea. Last year, the oldest child was terrified of Santa, this year she was the first one to get to him while her little brother was the one in tears. 3: Heard of salsify? We hadn't until this weekend when I picked some up from Farm to Family for a winter vegetable roast. Find the details on how I prepared these fibrous vegetables here. 4: After picking a crate of clementines at Wholefoods Market today, Mary got busy with a new diy project — she's good like that and I got to eat the clementines. More on that project later in the week. 5: We sat down and tackled our collective holiday card list this weekend! It's becoming a little tradition of ours (3 years now) to order our cards from a new seller on Etsy. This year our greetings came from the newly launched shop called MadeByCori. The cards have a wreath design on the front reading, be joyous, and the interior of the cards contain the definition, joyous: full of happiness and joy. 6: It's officially "chili" weather in our neck of the woods. I pulled out an old favorite recipe combining pork, red beans and a blend of spices — oh and coffee! Yes, this is chili with a kick! This will show up next Saturday in my Hills and Heights Saturday "Soups and Stews" series. Line cookie sheet with foil. Mix corn syrup, sugar and water and boil to hard cracker stage (candy thermometer reads 300°). Add cinnamon or peppermint and food coloring , mixing well (quickly). Pour into foil lined cookie sheet to let cool. While still warm, sprinkle light dusting of powdered sugar. After candy has completely cooled – break into small pieces. Corinna's secret for success: the cinnamon oil can be quite strong when adding to sugar mixture, I tend to mix the cinnamon into the candy outside for ventilation. P.S. Have you seen this collection deemed the most powerful photos of 2011? If not, there's some pretty powerful things that happened across the world — all in a single year. and the chili looks delicious. Putting dark chocolate and cinnamon in chili is really tasty too....and an occasional bottle of beer. My Mom always makes that hard candy for Christmas. So good. So so so good on so many levels. I'm surprised we even have any left in the house. @Rose - I've never thought to put dark chocolate in chili but then again I'd never thought to put coffee in it either!